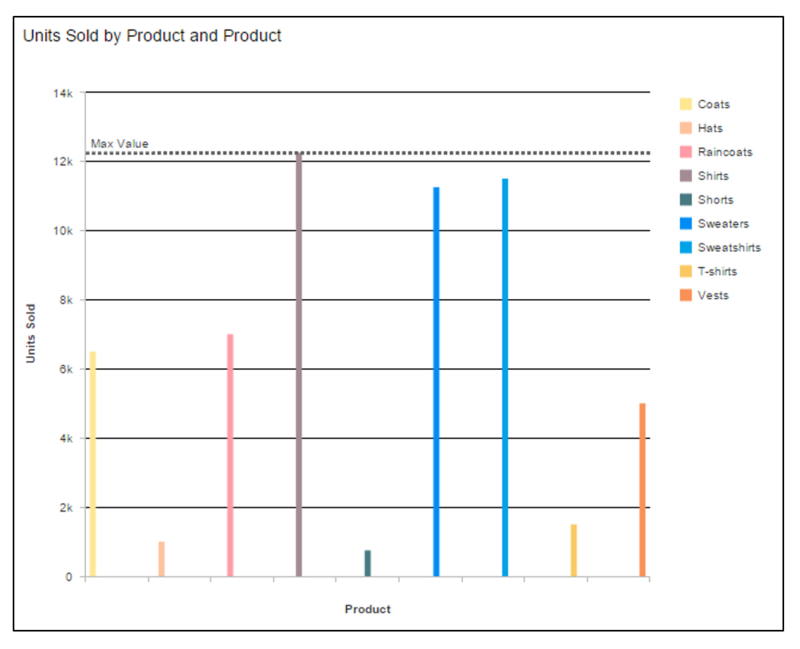 This blog is part of a series to highlight useful features, tips and tricks to assist with good data visualization practice in Lumira 2.0 Discovery. The great modernist architect Ludwig Mies van der Rohe, is often credited with coining (or at least popularizing) the phrase “Less is More”. Rarely is this axiom more appropriate than in the art of good data visualization. We are increasingly inundated with huge volumes of data and with increasing capabilities with which to show such data – as such, it is easy to fall into “traps” to over-elaborate our data visualizations and cause the essential meaning of our data to be hidden or lost. 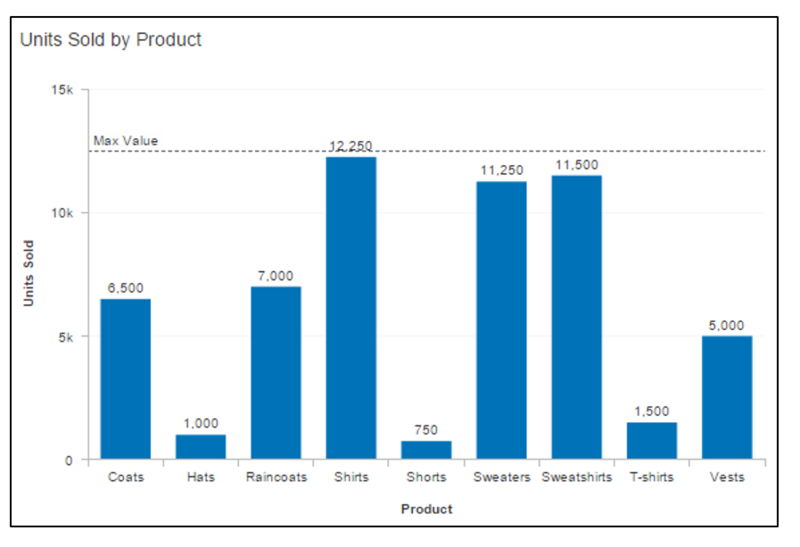 SAP Lumira allows great power, flexibility and features to craft your data visualization and add “embellishments” – but exercise due caution and remember often that Less is More! 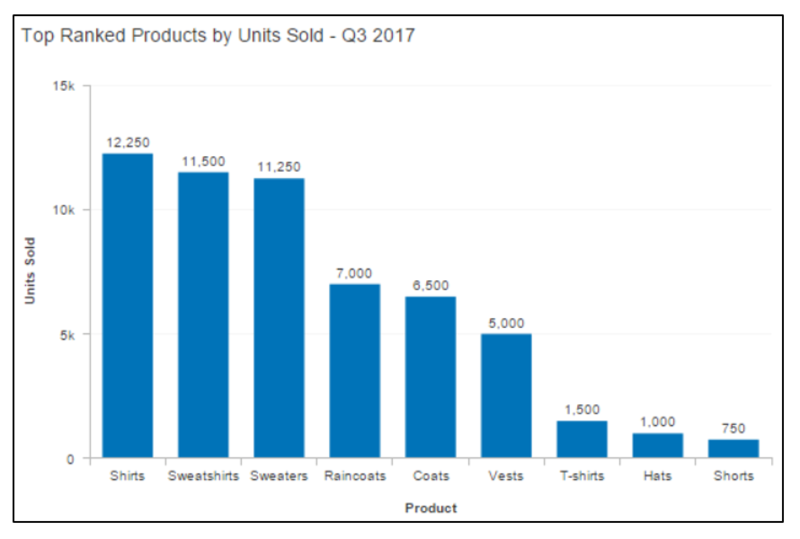 We could leave this data as a crosstab but it can look fairly “plain”, so the temptation is to represent it in another type of data visualization, for example a column chart. 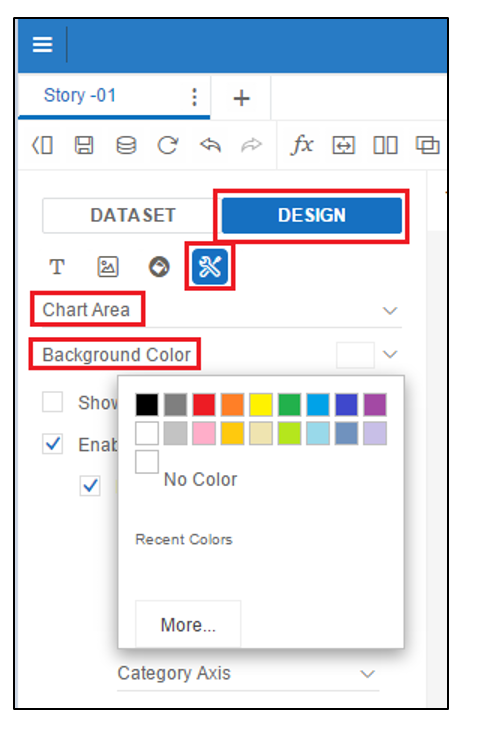 With flexible self-service BI tools like SAP Lumira, it is very quick and easy to add data visualizations and to “enhance” these with many (apparently) cool and colorful features. However, care should be taken as, without due consideration, the essential meaning of the chart data can become quickly obscured and difficult to extract. Hopefully no one would produce anything as hideous as this particular column chart! 😉 – but it can be done in Lumira and serves to point out some easily acquired traps/pitfalls in visualization techniques. 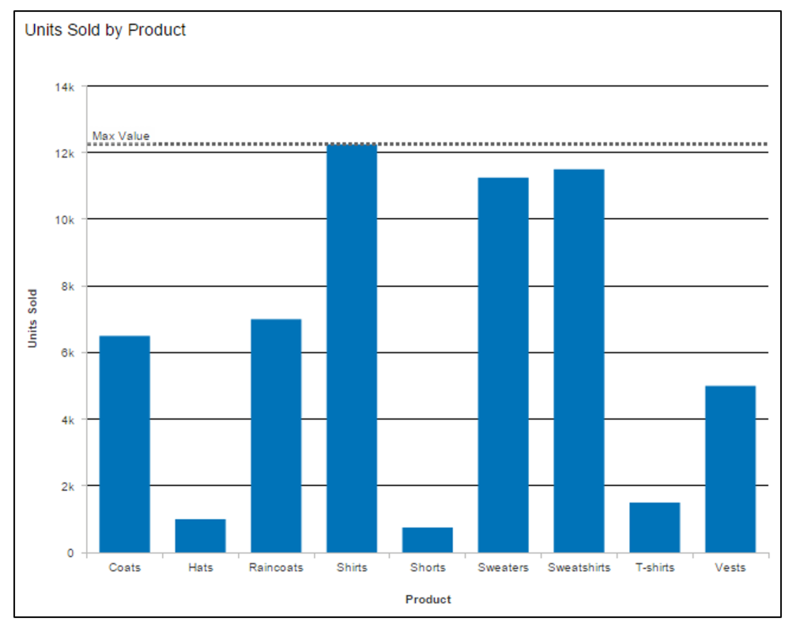 The chart data is not in any specific order – should it be ? The yellow (Coats) and orange (Vests) columns are prominent against the blue background – why? Is there some special significance to these columns? Use the “Squint Test” – squint your eyes to see which chart elements stand out visually – are they the ones that are meaningful and appropriate? (Repeat this also for the Chart Plot Area). >>> Note, the use of color is a subjective and often controversial topic. If background colors are mandated, for instance due to corporate branding standards, consider using one of the many free resources that are available to help you choose appropriate color schemes – for example Adobe Color or Color Scheme Designer. However, the improvement in clarity is still not enough. 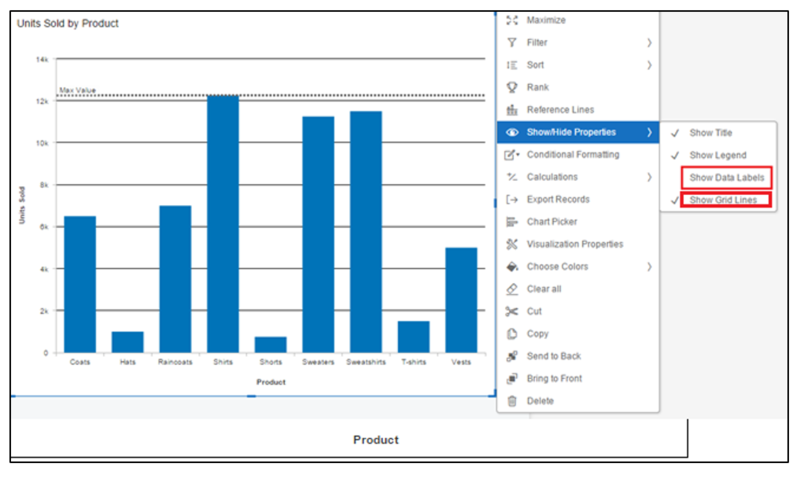 The data values can be added and the grid lines removed via the “Show/Hide Properties” menu, that is available by right-clicking on the visualization (“Show/Hide Properties” gives quick access to the most commonly used visualization properties). 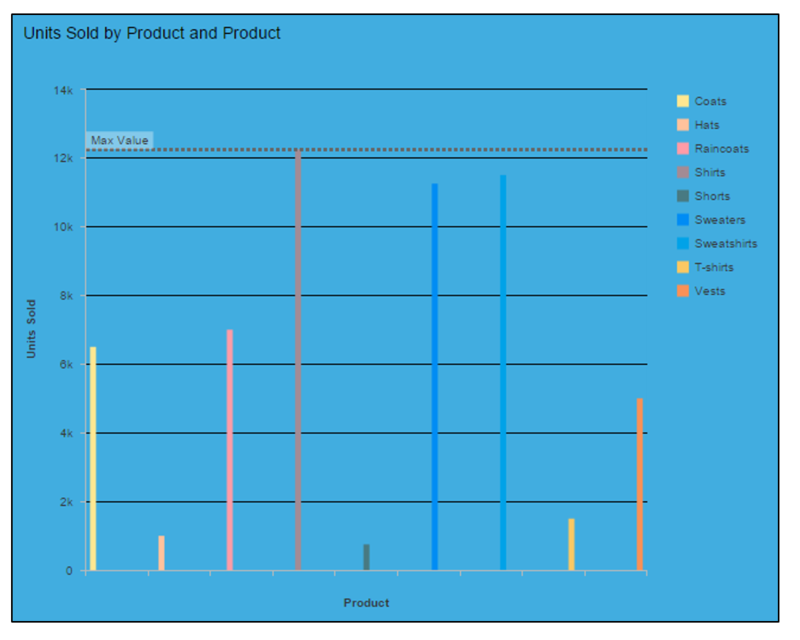 And clearly now, displaying the column data values invalidates the need for the “Max Value” reference line – this can be removed by right-clicking on the chart again and selecting the “Reference Line” option. Sort – and Bring Order! This above visualization is a great improvement over the original – but the data is not in any particular sort order. We can bring further clarity by sorting it – (to do this right-click on the visualization and then select (for example) a descending sort). 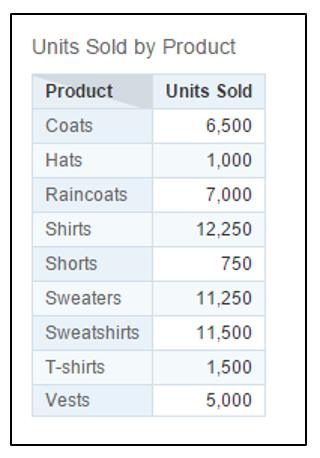 The result of sorting, implicitly shows the ranking of the products in terms of Units Sold. 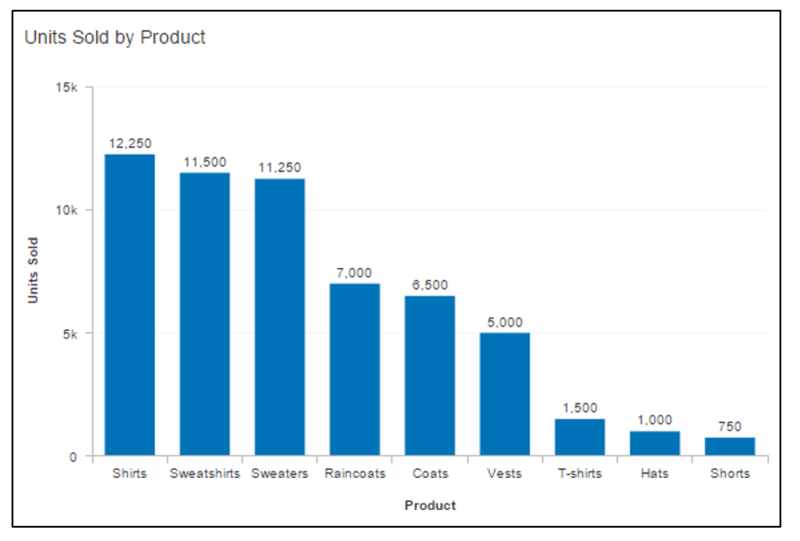 This further invalidates the need for the previous “Max Value” reference line as the viewer’s eye is automatically drawn to the product with the maximum quantity of units sold (Shirts) as well as highlighting its relative rank in relation to the other products. Finally – applying a more meaningful chart title brings additional clarity to the chart’s purpose (update the title by simply double-clicking on it and overwriting with the desired text). While the above chart visualization is less colorful and thematic than the original, I hope the point is made that it is much better at conveying the key insights of its data in a rapid, and understandable fashion. Removing the chart clutter, removing the junk is often key to improving the visualization’s impact and insightfulness. Less is (often) more! 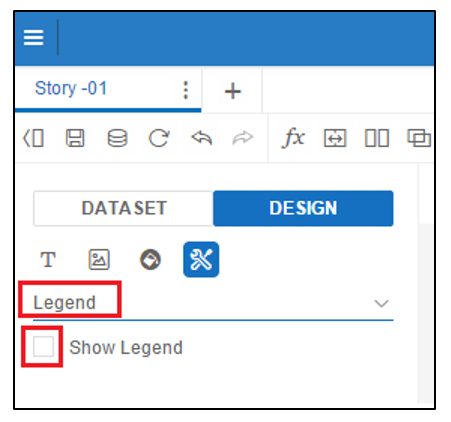 The “SAP Lumira Data Storytelling Handbook”. Good article, but one addition: When the value labels are activated and bars sorted, there’s no need anymore for the value axis on the left, right? 😉 This cleans it up even more. Great point – you are correct in that the left axis values could also be removed since the column data values are displayed. However, I left it there as it provides a sense of “scale” to the displayed values – i.e. especially in relation to the top axis value of 15k. could such kind of chart design saved as a template to be reused? I’m not sure that I completely understand your question – but you can create the chart visualization/design and then point it to different datasets in order to display different data values. 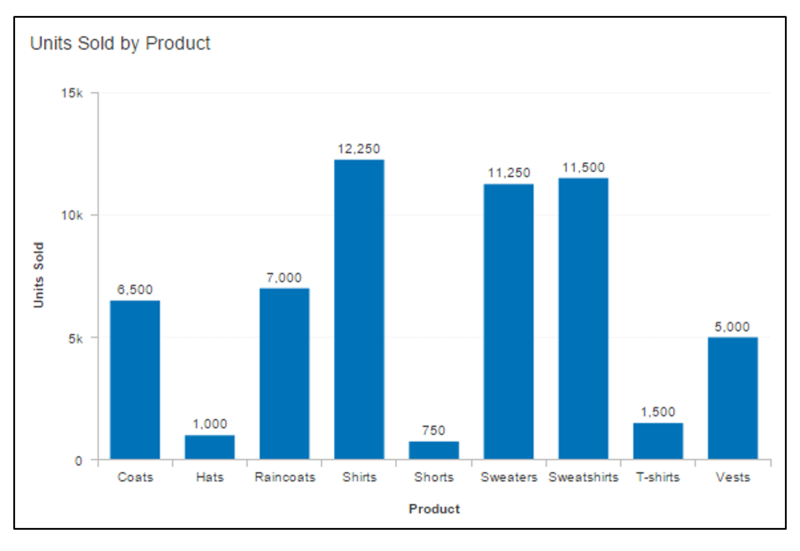 If you create the Crosstab (table) chart first and then convert it to a bar chart (using the Chart Picker right-click option) the Data Values should reflect the new format. Please let me know what is the migration strategy for Migrating the already existing Lumira to new host. We have to take our old Lumira to old Host, we have to take it to new host.